Nepal despite being a small country, it has great geographical diversity Nepal. There are amazing features and structures from low plain lands to highest peaks. It is amazing that Nepal has the deepest valley and at the same time highest peak. Mount Everest, the highest peak of the world lies in Nepal. Nepal is landlocked by India in the south and by china in north and thus Nepal has the amazing climate of India and China both giving it diversity. As we all know Nepal has the most number of Mountains and out of 14 highest peaks in world, seven lies in Nepal. These peaks and himalayas are the source of lakes and rivers in Nepal. These mountains are not just peaks but the pride of country. These peaks have made Nepal stand strong in the world. Nepal is known as Land of Himalayas. And of course this geographical structure has helped the tourism industry of Nepal a lot. Many tourists every year visit the country to view or even scale these mountains. These mountains have helped a lot I developing life style of people of that particular region. These mountains have given us a lot and we must be really thankful to mother nature for all that she has given to Nepal. Mount Everest is the pride of country. The highest mountain peak in the world lies in Nepal. Nepalese call Mount Everest SagarMatha . It got its name Everest from Sir George Everest. 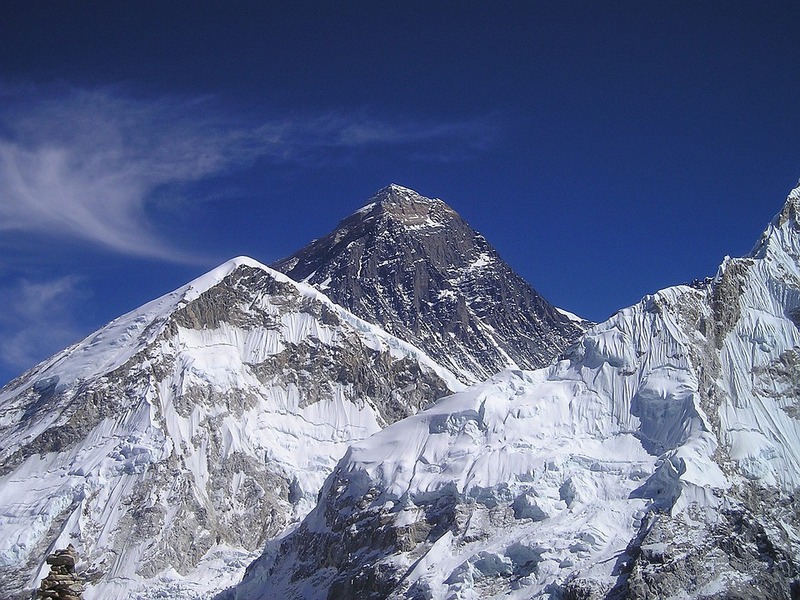 Mount Everest is 8848 meters high from sea level . It lies in Solukhumbu District in the Khumbu Mahalangur Himalayan range. Sir Edmund Hillary and Tenzing Norgay Sherpa were the first ascenders of Mount Everest. They scaled the mountain in 1953 , Sherpa was a Nepali National whereas Hillary was from New Zealand. Since them many mountaineers have scaled the mountain . In fact it is very big business and Mount Everest is one of the largest contributor in tourism industry of Nepal. People often scale Mount Everest out of their dream and passion even though every year many people die in the peak. But it is very unfortunate that Mount Everest is these days becoming very polluted , it is covered with trash and wastes caused by the tourists and even corpses. Kanchenjunga is the third-highest mountain in the world situated in Nepal. It is 8586 meters high from sea level . The mountain is called the five treasures of snow as it consists of five peaks . Kanchenjunga lies partly in Nepal and partly in India. The name originates from Tibet and implies the “ five treasures of snow “ KanchenJunga is one of the most difficult mountain to scale because of its geographical difficulty. This is another reason why Nepali and Indians consider Kanchenjunga sacred. They believe the five treasure of world are hidden in the five peaks of Kanchenjunga and these treasures will reveal only when the world is in grave peril. Gorge Band and Joe Brown from England were the first to scale the mountain. After that many climbers have scaled KanchenJunga safely despite the difficult topography. Lhotse is the fourth highest mountain in the world and is a part of the Mahalangur himalayan Range and Mount Everest massif. The mountain stands 8516 meters high from sea level making it the fourth highest mountain in world. It got its name from which translates to “ The South Peak” . It comprises of three peaks- the main summit which is 8,516 meters, the Lhotse East (8,414 meters) and the Lhotse Shar (8,383 meters). The route of Lhotse and the route of Everest is almost same as they lie in the same himalyan range. That’s why Lhotse is also quite popular in terms of mountaineering. Lhotse is often called “The Mountain Wall of Legends” because of its mysterious structure and the blue ice glacial. People believe they are the most beautiful glacial in the world. It was first scaled by Ernst Reiss and Fritz Luchsinger part of Swiss Expedition in 1956 . the team scaled the main summit at 8414 meters high. Lhotse Shar was climbed by Austrian Sepp Mayerl and Rolf Walter on 1970 whereas Lhotse Middel was acended by Eugeny Vinogradsky, Sergei Timofeev, Alexei Bolotov and Petr Kuznetsov of a Russian expedition in 2001. Since then there have been many climbers and mountaineers that have ascended the mountain. Mount Makalu is fifth highest mountain in the world . It lies in the border of China and Nepal.The mount is named after Lord Shiva. Mount Makalu is also called Kumba karna named after the giant in the Ramayan. It is also a part of Maha langur range and lies in the Khumbu Region. The mountain stands 8481 meters high from sea level. Lionel Terray and Jean Couzy were the first ascenders of the mountain. As a part of French expedition they scaled the mountain in May 15, 1955. Mount Makalu is one of the toughest mountains to scale. It is dangerous in terms of steep slopes , open edges and the difficult routes as well. Because of that, only few mountaineers dare to climb Mount Makalu. It is isolated and untouched there the Gurung , Rai who live in the area are culturally rich and prosperous. Mount Cho Oyu is the sixth-highest mountain in the world and the name comes from China. Mount Cho Oyu lies partly in China and partly in Nepal.In fact ,Mount Cho Oyu is a border separates Nepal and China. Cho Oyu means “Turquoise Goddess”. The mountain is considered holy in Tibet and in Nepal as well. This mountain is 8188 meters high and lies in Khumbu Region, a part of Maha Langur Himalayan range.The mountain was first scaled by Pasang Dawa Lama, Herbert Tichy and Joseph Jöchleron October 19, 1994. Because of its easy geography this is quite popular . The mountain is climbed from a route in Tibet.